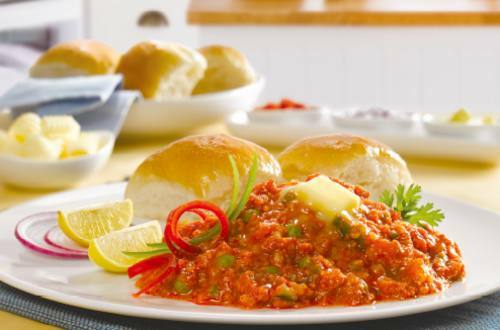 Savour spicy, buttery, restaurant-style Pav Bhaji with just the perfect thickness and colour. 1 Pressure cook vegetables (potato, capsicum, carrot, green peas and cauliflower) in excess water. 2 After pressure cooking, decant the water in a separate vessel. Mash the vegetables. 3 Heat oil in a kadhai ,add finely chopped onion cook until it turns translucent. 4 Add finely chopped tomatoes and cook till masala leaves the oil. 5 Add ginger-garlic paste and cook for 30 seconds. 6 Add red chili powder, turmeric powder, coriander powder and salt to taste. 7 Now add tomato puree and cook for two minutes. 8 Now add mashed vegetables and water (kept in the vessel) and mix well. 9 Add Knorr Chef's Pav Bhaji masala and cook for 2-3 mins. 10 Garnish with chopped coriander and 1 tsp of unsalted butter. 11 Serve hot Pav bhaji with Pav, lemon wedges, finely chopped onion and enjoy.